"Elk, you idiot. Why are you always such trouble?" 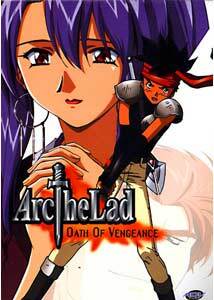 Oath Of Vengeance is the penultimate volume of Arc The Lad. The saga of Elk, Arc, Lieza, and crew comes to a crucial point here and the future of the world rides on their decisions. As this volume begins, Arc and his rebels make their final move to free the country of Smeria. As they do, the evil imposter lord flees, but in the process destroys the protective barrier around the shrine of spirits, leaving the resistance very vulnerable to sabotage. Ultimately, Elk is confronted with the fact that the spirits of flame are revoking his power until he learns to stop using it for revenge and, instead, uses it to protect people. Elk abandons the cause in his depression and meanwhile Arc unites the oppressed people of Smeria together to reconstruct the government and a means of defense against the military. A partial victory is seen here, but unfortunately, there are still many problems left in the world. I've noticed in previous volumes that, occasionally, there will be an episode that takes a sidetrack from the central theme and presents a simple, one-episode story that highlights some emotional background for characters. Such is the case with number 18 here, in which Elk decides to hide out in the thick of the Smerian city. While living on his own, he encounters a little blind girl who sells flowers. She is relentlessly teased by the public, because everyone thinks she's a Chimera monster, but Elk decides to befriend her. He discovers that the reason for the rumors is that the mysterious old man that cares for her actually IS a Chimera, or in the process of becoming one. The girl does not know this but, not surprisingly, the man reveals to Elk that the Nameless Crusade did this to him. After a time of rest and meeting his old friend Shu again, Elk realizes he must rejoin the fight against the military, even if he can't use his powers. So the story continues in its old way, but of course, Clive is plotting behind the scenes for something horrible. Once again, he wants to create a new Holy Mother to manufacture Chimera and to help open the legendary Ark. What is the Ark exactly? No one is quite sure, but to attempt opening it would bring about the fall of the entire world resistance. The disc ends in tragedy, but also with a new resolve: to stop the remains of White House and the Nameless Crusade no matter what the cost. As Arc The Lad nears its end, it remains just as solid as ever. Although more of a dramatic series than one based on action, it certainly sets very high standards for this kind of anime. One complaint I've often heard is that the character of Elk is a bit shallow and not well-developed, but this is purposeful, in a way. Once he realizes many of his own personal problems here in this volume, a lot of things change about him; he becomes more dynamic. True, the series only has one more volume to go, but it was important for him to remain the way he was for this long. Now that he begins to clear up some of his emotional drawbacks, he goes into the final stretch as a new person, and what a final stretch it should prove to be. Image Transfer Review: There is absolutely no movement or grain anywhere in the image; a pristine transfer, as usual. Completely solid colors and superb clarity follow through with another impressive entry in the show. I wish all anime could look so good on DVD. Audio Transfer Review: The 2.0 mix is very fitting; loud, yet subtle when it needs to be. All the elements are presented in the best fashion possible. There were no instances of real surround usage, but the track itself sounds very expansive as it is. Extras Review: Other than trailers like Robotech, Gasaraki, and Getter Robo, there are no significant extra features to speak of. I just recently noticed, however, that it's a bit hard to tell the order of the volumes just from looking at the cases, as there are no numbers on them. Instead, customers will need to eye the small screenshot of the main menu on the back of the case to judge which episodes are on the disc. As I've previously mentioned, the actual video games upon which Arc The Lad is based will be releasing in the U.S. this year. The publisher, Working Designs has recently announced the full details of the set of four games (Arc The Lad 1-3, and Arc The Lad Monster Arena), in what has become affectionately dubbed 'Arc The Load', for its weighty extras, including one of 14 special edition watches and a 140-page, leatherbound manual (full details here).